I hope he makes it through OK. There's one song with Frida [Hyvönen] that is a song that we wrote together in Finnish that I think is coming out sometime. I played it for a lot of people. It almost made it onto the album, actually. I think it would have actually fit pretty good on the album. But we just took the four phrases that we knew in Finnish-- she knew two phrases, I knew two phrases-- and we just wrote them down and realized, "Oh, this would actually make a really great song." And it starts off, like, I sing, "I love you," and she sings, "I'm sorry, I don't understand." And I repeat, "I love you," and she says, "I'm sorry, I don't understand." And then the chorus goes, "Wonderful, cutie-pie, wonderful." And that's the whole song, but it's a really beautiful song. Yeah, you will love it. I think you will really like it. So I was thinking of just trying to settle down. I think I need a new home and a new place and to see how that place and home and how the people who live there will influence my music. I guess that will be Melbourne, if I don't find something else before that. It's going to be interesting. No, I don't have a girlfriend. No, I don't. I haven't had a relationship in years, actually. But yeah, I'm still looking. It's kind of nice to be looking for a home at the same time. And I really think I need to find a home. I don't know if that includes a girlfriend or not, but first I need to find a home, definitely. Because I felt pretty homeless in the last couple of years, and I never felt at home here in Kortedala. So it's time to find someplace where I feel like it's home. There is also a rumour (floating around a certain message board) that Jens has plans to relocate to Melbourne for a year in 2008. 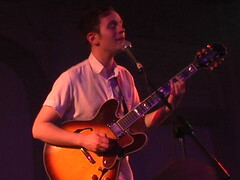 Last night, I went to see Jens Lekman, the Swedish indie singer-songwriter, at Bush Hall. He was excellent. There were two supports: the Bill Wells ensemble, and some chap named Richard Swift. The former (who are from Glasgow and have played with Belle & Sebastian) also doubled as Jens' backing band (and did a sterling job of it); in turn, Jens joined them on stage on various instruments during their set. They were quite good, in a jazzy sort of way. The Richard Swift outfit, however, seemed a bit too loud; their sound was distorted and harsh. Shortly before 10, Jens came on with an acoustic guitar, and performed an unplugged acoustic version of Happy Birthday, Dear Friend Lisa, segueing into an unrecorded older song titled Are Birthdays Happy? ("Are birthdays happy, or just a countdown to death? "), before being joined by the band (three women on brass, a drummer, and Bill Wells on piano). He played a few songs familiar to anyone who has his CDs, including good renditions of Black Cab, A Sweet Summer Night On Hammer Hill, You Are The Light By Which I Travel and a version of Maple Leaves with both English and Swedish lyrics, and a few other ones, which may have been newer, older or both; he sang and played bass, guitar and electric thumb piano, playing for about an hour. Then, when the gig finished and everybody was turfed out of the hall by the management, he materialised behind the merchandise stall with an acoustic guitar and regaled the assembled punters with two songs, I Don't Know If She's Worth 900 Kronor and Tram #7 to Heaven. This February so far has been a record-breaking month for gigs; in the past 2 weeks, I have seen what could well be three of the best gigs of 2006. 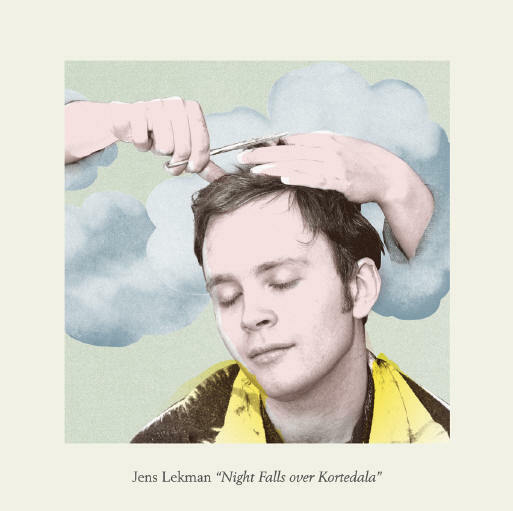 Anyway, Jens Lekman is a class act in every sense, and those reading this in Melbourne should consider yourselves lucky to get to see him with Guy Blackman and part of Architecture In Helsinki as a backing band soon. Pitchfork interviews Jens Lekman, in which he talks about how he deleted all his unfinished songs from his computer and went to work in a bingo hall to take a break, the numerous records he has sampled, being beaten up by Morrissey fans (apparently the jock bullies in Sweden listen to Morrissey) and his coming Australian tour, backed up by Guy Blackman and members of Architecture In Helsinki.